I left Las Vegas the afternoon prior, driving to Flagstaff, AZ, another state closer on my trek across the Western US to Telluride, CO. I planned to spend a few days in the area tagging some prominence summits around town. The weather forecast had 70-80% chance of thunderstorms over these two days, which pretty much means it's only a matter of when the rain would start to fall, not if. There had been some heavy rain during the last half hour of driving into Flagstaff, so I was pretty much accepting that there'd be some wet hiking the next day. And while my boots and pants got some wetting in the early morning from the plants, for the most part I did pretty good, drying out soon enough and then only getting new rain towards the end. I spent the night camped a few miles west of US180 at the base of Wing Mtn, on a good Forest Service road with lots of dispersed camping for myself and the few others I saw on the drive in. Wing Mtn is an old cinder cone with nearly 1,000ft of prominence and well-forested. One can climb it from any side, with open forest floor covered in duff, easy cross-country but quite steep. It took me just over half an hour to cover the 0.7mi distance to the summit where I found a circle of rocks, but no register (none on any of the summits I visited today). There are some partial views during the ascent and at the summit (particularly to the San Francisco Mtns to the northeast), but for the most part the forest cover is complete. I took a slightly different angle on the way back to visit Little Wing Mtn which turned out to be a complete dud. It's almost impossible to discern any sort of highpoint along the rolling terrain of the forested mesa which would be better description than "mountain". It was pretty much like geocaching to find my way to the coordinate identified on LoJ, but almost any point was as good as another. An odd name for another forested cinder cone a few miles SE of Wing Mtn. Others have reported on PB approaching from the south, but I used a northern approach since I was already near US180. I parked at a paved cul-de-sac less than a mile from the summit, but high-clearance vehicles can drive a forest road to cut the distance in half. The hike was very similar to Wing Mtn - short but steep up forested slopes littered with forest duff. The highpoint is found at a small rock outcrop just south of the benchmark (which took a little hunting about to find). Not much in the way of views here either, taking an hour roundtrip. 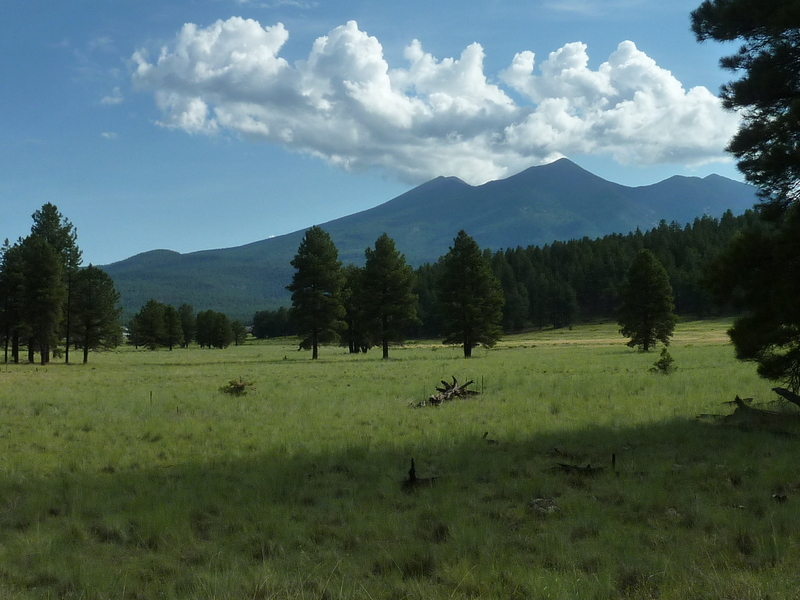 A southern extension of the San Francisco Mtns, Elden Mtn overlooks Flagstaff to the north. The summit is crowned by a lookout and large array of telecom towers with a service road reaching it from the west and north. The road can probably be driven by any vehicle (not sure, since I didn't drive it) but the more sporting route is from the southeast off US89 via the Elden Lookout Trail. There is a fairly large TH lot just off the highway, one of half a dozen trailheads around Elden Mtn that can be used to access a whole network of trails. The Elden Lookout Trail appears to be quite old, somewhat eroded and very popular. There were about 10 parties on the trail on a mid-week morning during my visit. The trail to the summit is 2.5mi in length over which it gains 2,400ft - pretty steep. And rocky, too, but in a good way. The volcanic rock has good traction even when wet and with fairly heavy use, most of the loose rocks have already been uprooted. There are some views of Flagstaff's industrial quarters along the trail, but nothing very inspiring. Traffic noises from the highway below can be heard nearly to the summit - not a wilderness hike, this one. Reaching the summit after an hour and 20min's effort, I sat under the lookout tower to rest and give the sweat on my back a chance to dry. The lookout was manned and open for visitors, but I decided not to go up as is my usual practice. I think I'd seen enough people on the hike and was looking for more solitude. I hiked the various service roads to the north and west to pay visits to a pair of minor bonus summits. Both of these had their own set of towers (one in fact was simply named "TV Hill", and there were technicians working at two different sites. Neither bump offered views better than can be had from Elden Mtn. While I was visiting the last one, Devils Head, the lightning, thunder and accompanying rain & hail began to start up. I donned my rain jacket as I started back, but took it off again when the rain let up as I returned to the Elden Lookout Trail. The rain had let up but the thunder & lightning intensified as I descended the trail. One guy coming up remarked that "a few more thunderclaps and I'm heading back," but I doubted that. I think he said it just so I wouldn't think him crazy to continue. Some of the thunder had been deafeningly loud following only a split second from the lightning flash, so we both knew it was directly overhead. I'd have probably done the same thing. After all, what bad could happen? An easy drive up. Mars Hill is the site of the Lowell Observatory erected by Percival Lowell in the 1890s. He was a world-reknowned expert on Mars, having "discovered" its canals using his 24" refracting telescope. Subsdequently it has been conjectured that he was seeing the capillaries in the back of his eye superimposed on the view of mars. Oops. Better, the observatory was the site of the discovery of Planet X in 1930 which became Pluto which in 2007 was stripped of its title and recategorized a dwarf planet - little better than a large asteroid. Drats. Adult pay $15 to visit the observatory though one can enter via other clandestine routes to reach the highpoint in a small grassy area next to the telescope. Percival was buried near here, too. The site is open 10a-10p most days and on clear nights provide viewing to the public through the 24" telescope.